Boutique-style, b&b ensuite accommodation in charming, newly and luxuriously refurbished 250 yr old Chapel Cottage in the centre of Nottage Village, close to the Royal Porthcawl and other golf clubs in the seaside town of Porthcawl. The accommodation offers seclusion via the self-contained private entrance into the delightful cottage garden, where guests are welcome to sit and relax. 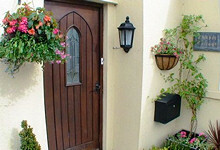 The cottage is within a minute’s walk of the local pubs, serving delicious meals, fine wines and beers. The room-only rate is from £50 per night, breakfast by request. However, the accommodation is equipped with fridge, toaster, tea/coffee-making facilities, cutlery/crockery, and guests are welcome to provide their own light breakfast in the comfort and privacy of the conservatory/breakfast room. Freeview TV, CD player, Wi-Fi, hairdryer, games are also provided. You will thoroughly enjoy your stay at the unique Garden Room at Chapel Cottage.